In September 2015, I was an elementary school teacher-librarian eagerly trying new learning devices and constantly encouraging my students to bring in gadgets and gizmos to show. Enter Jacob Sachtjen. Jacob was a precocious fourth-grade student with a love for technology. Over the summer, Jacob and his siblings had received a new robot kit from Wonder Workshop. I had seen these new robots promoted through crowdsourcing campaigns on Facebook. Dash and Dot were well-engineered, colorful, and friendly looking. A technology that promised to bridge the gap between coding and physical computing. Dash and Dot seemed full of potential. I was eager to learn more and had a willing learning ally in Jacob. After gathering parent permission, Jacob brought his team of robots to school. In front of an excited audience of first-graders, Jacob unleashed the awesomeness of Dash and Dot! Jacob started by showing the class the coding and driving functions. Next, he has the class listen and watch as Dash performs a song Jacob had programmed. The audience went wild. It was immediately clear to me that Dash and Dot were standout learning tools. In 2012, a small group of developers began collaborating on a project that would teach coding concepts to young children. Inspired by the daughter of Wonder Workshop’s Co-founder & CEO, Vikas Gupta, the team set out to build a device that could teach coding, while providing an output for the lines of code that kids write. Two and a half years later, with countless hours spent on ideation, prototyping, testing, and crowdsourcing, Wonder Workshop welcomed their first production run of robots. Dash and Dot were well received by parents and educators alike. Wonder Workshop quickly earned acclaim, including, Good Housekeeping’s Toy of the Year and Scholastic Parent and Child’s Gold Star Toy of the Year, just to name a few. In the four years since Wonder Workshop began production, they have continued to innovate and expand the reach of Dash and Dot. This year, at ISTE in Chicago, Wonder Workshops latest robot made a splash. Cue, the cleverbot with big attitude, was enthusiastically received by educators from across the world. Cue was developed with middle school students in mind. With proximity sensors, IR interaction, and personality profiles, Cue is sure to be a hit with the pre-teen crowd. My favorite feature is Cue’s multiplatform functionality. Cue’s app is available on Apple iOS, Android, Kindle, Chromebook, and Windows 10 devices. With immersion into the educational market, Wonder Workshop has delivered robust educational resources, including, challenge cards, coding & applied robotics curriculum, and most recently, Teach Wonder, their beautifully developed on-line professional development suite. If you are anything like me, a busy educator, finding time to take classes and learn new tech skills is difficult. There are never enough hours in the day or months during summer to get it all done. Thankfully, Wonder Workshop has heard us! Not only have they developed a groundbreaking on-line professional development suite, they are offering their 12-hour foundational course, plus a Dash Robot for $125 from NCCE ($350 Value). This first course, Introduction to Coding and Robotics with Dash & Dot, has six two-hour modules for teachers to complete at their own pace. I am impressed with the focus on educational theory and pedagogy and their use of FlipGrid as a reflective learning tool to connect like-minded educators. The scope and sequence of the course is designed to instill confidence in teachers of all coding levels and to build the knowledge and skills needed to bring state-of-the-art coding and robotics experiences into every classroom. As an organization whose mission is to offer high quality professional development to educators, we are very excited to offer this training package. We are also thrilled to announce that this course is eligible for Washington State Continuing Education hours or a University of Idaho Professional Development credit (clock hours and credit are an extra fee not included in the $125 cost for course and Dash Robot.) Instructions to redeem clock hours or credit will be sent with the discount code. Visit NCCE.org/teach-wonder-workshop/ to learn more. Last week was my first week back teaching in a high school library in eight-years. After being so focused on immersing K-5th graders in STEM and Maker focused activities, I was curious to see how the teen set would react to tech geared for younger students. Student met Dash, Dot, and Cue with an enthusiastic welcome. The high schoolers were quick to learn the coding ins and outs of Dash, while others were intrigued by the interactive games they could play with Cue. It is safe to say that this trio of cleverbots will be making regular appearances in our school library. As for Jacob Sachtjen, he is a successful middle-schooler focused on STEM. I am so grateful to Jacob for sharing his love of technology with others. There is no telling where this young man will finally end up, but it is safe to say that his future is very bright indeed. Morgen Larsen is the Tech Savvy Librarian at Central Valley High School, in Spokane Valley, Washington. With over 19-years of classroom & library experience, spanning elementary to high-school, she stays on the cutting edge of EdTech by purposely embedding technology into everything she does. Morgen facilitates the yearly NCCE Teacher-Librarian Summit and is an accomplish provider of professional development and teacher training, focused on the STEM and the Maker Movement. She is a Microsoft Innovative Educator-Expert Trainer who has trained educators across the United States, Canada, and the U. S. Virgin Islands. A constructivist at heart, she dissuades traditional siloed “sit and get” instruction in favor of hands-on cross-curricular teaching bursting with inquiry. 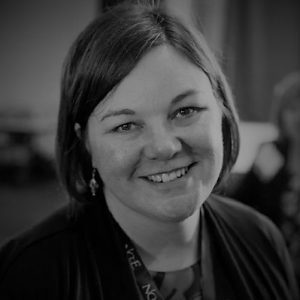 Her curriculum development work with Washington State OSPI OER Project, WSL/OSPI EdTech Standard Training Initiative, Minecraft EDU, and WE Schools (WE.org) are just a few examples of collaborations she is currently involved in. She has received numerous accolades including the CVSD Meritorious Teacher of the Year, Spokane Valley Chamber of Commerce Educator of the Year, and ISTE Make-it-Happen Award.